UPDATED: Thu., April 19, 2018, 4:24 p.m.
PODGORICA, Montenegro – The European Union foreign policy chief on Thursday hailed efforts by nations in Western Balkans to advance toward membership in the bloc, ending a tour of the volatile region where Russia is also vying for influence. Federica Mogherini spoke in Serbian capital Belgrade, the last stop of her trip that also included Albania, Macedonia and Montenegro. The region remains tense following the wars of the 1990s and the prospect of EU membership has proved an important driving force at reform. “Let me say that I am impressed by the energy, the commitment, the ambitions and the willingness everywhere … to move forward on the reform path toward the European Union membership,” Mogherini said at a joint news conference with Serbian President Aleksandar Vucic. The prospect of EU membership is “credible, real and tangible,” Mogherini insisted. EU officials have told Balkan countries they must resolve problems stemming from the breakup of the former Yugoslavia and implement a vast array of reforms in order to join. Macedonia has been locked in a name dispute with EU member Greece, while Serbia must normalize relations with the former province of Kosovo, whose 2008 declaration of independence it doesn’t recognize. In the latest illustration of regional tensions, a Croatian parliamentary delegation cut short a visit to Serbia on Wednesday after far-right Serbian leader and convicted war criminal Vojislav Seselj reportedly trampled on the Croatian national flag and insulted officials. Earlier Thursday in Montenegro, Mogherini praised the Adriatic country’s role in encouraging other Balkan countries on the EU path and because its policies were fully in line with those of the EU. 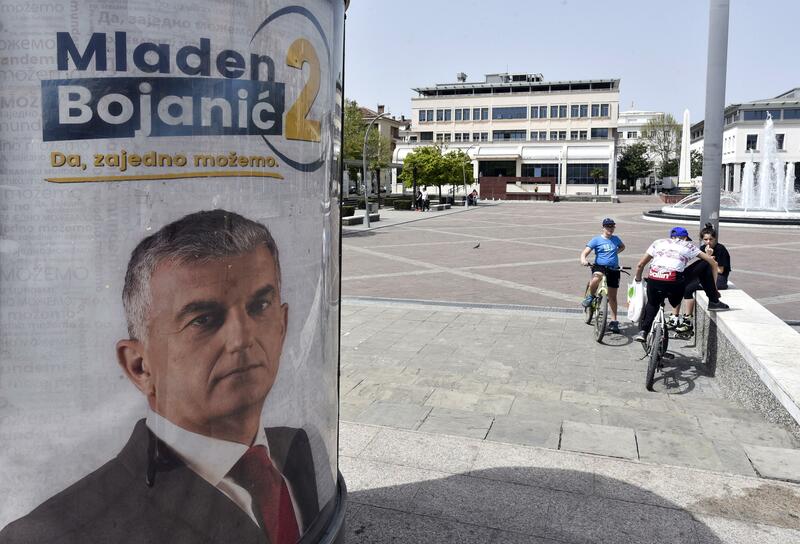 Montenegro, along with neighboring Serbia, has been tipped as the next in line to join the EU, after becoming a member of NATO last year despite strong opposition from Moscow. Mogherini says Montenegro must work to improve the rule of law and media freedom. She was the first foreign official to meet Montenegrin President Milo Djukanovic since he swept the election last weekend, promising to stay on the EU path. Russia has sought to increase its sway in the Balkans, which Moscow considers a traditional area of interest, particularly in Serbia. Belgrade has maintained close ties to Moscow, despite formally seeking EU membership. Published: April 19, 2018, 4:24 p.m. Updated: April 19, 2018, 4:24 p.m.